Spatial information and especially maps have become ubiquitous: many websites rely on maps for different purposes. Maps are used on mobile devices, for navigation systems, in analysis and planning tools, for information visualization, or in gaming. In many cases, these maps are not a static picture but support interaction, e.g. in order to change the displayed area, to find specific sites of interest, or even to edit the map and/or its underlying information. While map-making has a long tradition and consequently benefits from a large body of research to draw from, this is not true for map interaction. In contrast to map-making, there is no agreed-upon set of rules or guidelines that have emerged with respect to how to design interaction with maps. When looking at different popular web services or applications that use interactive maps, a broad range of different approaches become apparent. How we work with interactive maps thus is not only inconsistent across systems but can also be quite awkward. Even simple queries can require a lot of interaction, and the formulation of complex queries is sometimes not even possible—although we know more about the user, the context, and the task than ever before. Given the rapid proliferation of interactive maps and our increasing dependency on them (e.g. in the context of location-based services), a deeper understanding of how to best design interfaces for and interaction with maps is thus needed. This special issue aims to contribute to that understanding and to further spur development in this emerging area. The special issue was also inspired by a number of workshops on this topic, where promising ideas and novel perspectives on map interaction were presented. The four papers included in this special issue approach the overall topic from different perspectives. These include fundamental issues such as the degree of control users have over a map, different users groups (experts and non-experts) as well as map interaction as part of a complex visual analytics tool. The first article, “Controllability matters: The user experience of adaptive maps” (DOI: 10.1007/s10707-016-0282-x), tackles a fundamental issue of map interaction. The authors investigate controllability, i.e. the degree of control a user has over the behavior of the map. Using gaze-tracking as a method, they were able to show that a high degree of controllability results in better user experience and lower perceived cognitive load while also being preferred by users. Their findings have implications for the design of interactive and adaptive map interfaces in general. The second paper, entitled “Interactive shearing for terrain visualization: an expert study” (DOI: 10.1007/s10707-016-0283-9) investigates the use of shearing animations to enhance depth perception. In their study, the authors enabled expert users to interactively configure these shearing animations. They found that such animations help depth perception and also demonstrated the usefulness of interactively configuring map interactions. The third article on “how users perceive transparency in the 3D visualization of cadastre: testing its usability in an online questionnaire” (DOI: 10.1007/s10707-016-0281-y) reports on a study investigating transparency in 3D visualization. Focusing on ‘indoor’ maps, i.e. floor plans, the author reports on insights regarding the use of transparency and 3D visualization by non-experts. He highlights the need to consider the target audience of interactive maps. 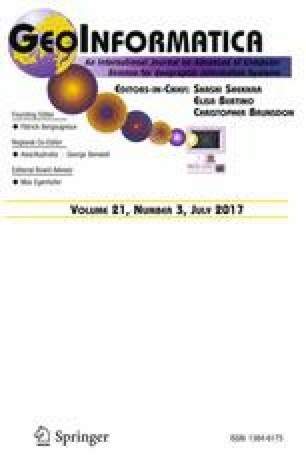 The fourth and final article in this special issue, entitled “PerSE: Visual analytics for calendar related spatiotemporal periodicity detection and analysis” (DOI: 10.1007/s10707-016-0280-z), looks at visual analytics, a field that aims to combine interaction and visualization to facilitate insights. In this particular case, the authors discuss a system aimed at supporting spatiotemporal analysis by providing multiple, interconnected views. One of the core elements here is a map that users interact with in order to gain a deeper understanding of the visualized data. In summary, the four articles included in this special issue provide distinct perspectives on the current state of the art in map interaction and also serve as a good starting point for further research in this area. We would like to thank the authors for reporting on their interesting work, and we are grateful to the reviewers for the time they invested in selecting and improving the papers. We hope that this special issue and the papers contained therein will further raise interest in the topic of map interaction and lead to more interesting work in this exciting area.